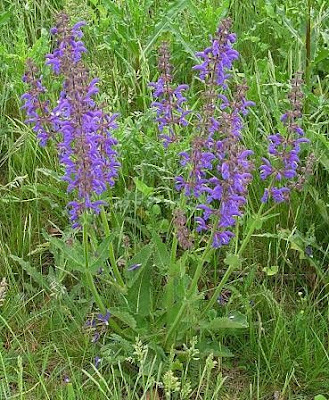 Meadow sage Salvia pratensis, photographed by Leo Michels. Salvia, the sages, is a cosmopolitan genus of herbs and small shrubs. Salvia officinalis is the culinary sage; other species are grown as ornamentals. White sage S. apiana is a small shrub found in south-west North America whose seeds were used as a staple by pre-colonial societies. Characters (from Black & Robertson 1965): Herbs or undershrubs with opposite leaves; flowers in bracteate false-whorls, forming long terminal racemes or panicles. Calyx two-lipped, 13-15-nerved, the upper lip three-toothed or almost entire, the lower bifid; corolla two-lipped, the upper lip erect, hooded, entire or notched, the lower three-lobed, the middle lobe the largest; stamens 2, the short filament terminating in a two-branched connective, the longer branch bearing one cell of the anther and the shorter branch an abortive scale-like cell; nutlets ovoid-trigonous, smooth. [O88] Ohba, H. 1988. The alpine flora of the Nepal Himalayas: an introductory note. In: Ohba, H., & S. B. Malla (eds). The Himalayan Plants vol. 1. The University Museum, University of Tokyo, Bulletin 31: 19–46. [PS05] Pusalkar, P. K., D. K. Singh, P. Lakshminarasimhan & S. Singh. 2005. Salvia reflexa Hornem. (Lamiaceae)—a new record for India. Bulletin of the Botanical Survey of India 47: 153–154.